Inspire Middleton and Upfest Charities. Over the past two years SoChill Circle has been present at some of the largest festivals in the UK including The Big Chill, Latitude, Download, Wickerman and Leeds festival. On top of the DJ's and Bands at the SoChill Circle, Upfest artists entertained the crowds throughout the festival weekends creating over 30 large scale Urban Art works on canvas. These canvases have now been kindly donated with 100% of the profits from this auction going to some great charities. Each artwork measures 180cm (width) by 150cm (height) on a handmade deep box canvas frame and is unique, not only will you be bidding on some amazing artwork, you’ll also be supporting a number of charities from Manchester and Bristol. 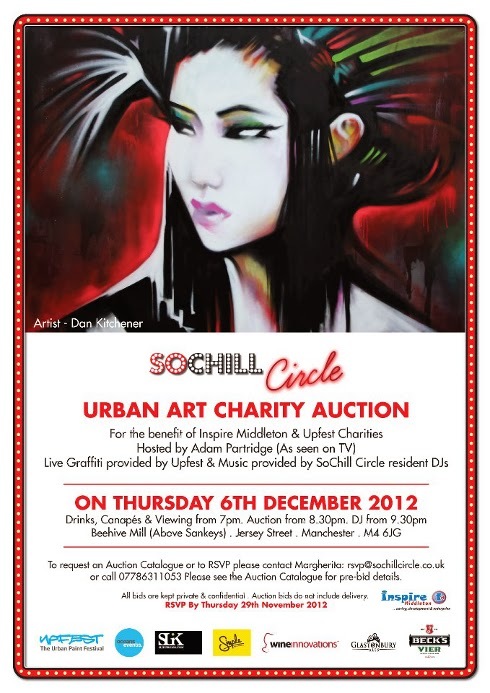 To attend the auction email rsvp@sochillcircle.co.uk, places are strictly limited so RSVP essential.